For the first time since Scars of Mirrodin, I actually played in a Prerelease. Now, this is not something I would recommend. You end up paying a premium to participate in these events. And unlike in paper, there's not the same experience of playing with these new cards for the first time, since there's typically at least a three week gap between a set's release in paper and the release on Magic Online. This time, of course, participation was free, courtesy of Wizards of the Coast as their way of saying thanks for putting up with the transition to the new version of the client. You can't beat free, and so I happily jump into the Casual Sealed queue not long after they were available. I wasn't thrilled about playing the Bronze Sable, Hammerhand, or Forge Devil, but I felt like they were the best of my available options. Hot Soup ended up being quite powerful, even when just equipped on a simple beater like Goblin Roughrider. I also considered including Resolute Archangel, but decided that seven mana was simply too much for what this deck was trying to do. I ended up finishing 3-1, and sold the rares for another 7 tickets, so overall I was very happy with how I did in the prerelease. So what did you think of my build? How did your own prerelease experience go? Let me know in the comments below. Thanks for reading. I like your WR build. It's good but can get stopped with Coral Barrier, Wall of Frost, and other X/4+ guys. 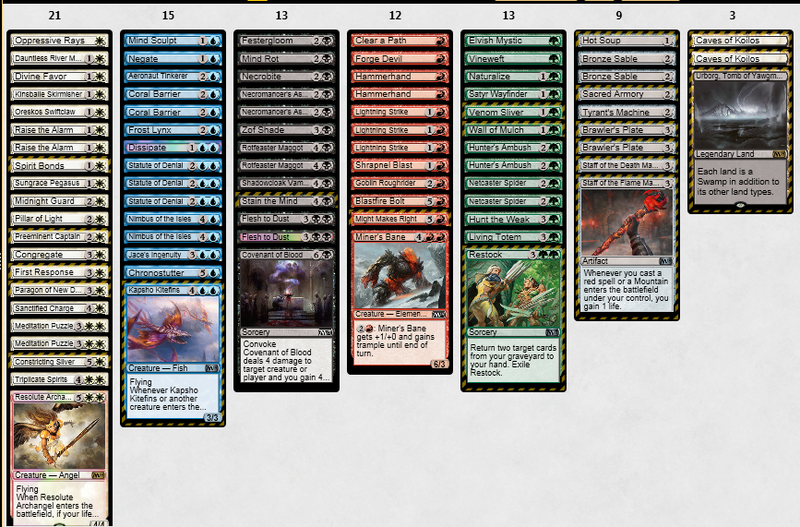 I'm looking to build a fatty deck in this sealed format unless you have the nuts aggro. 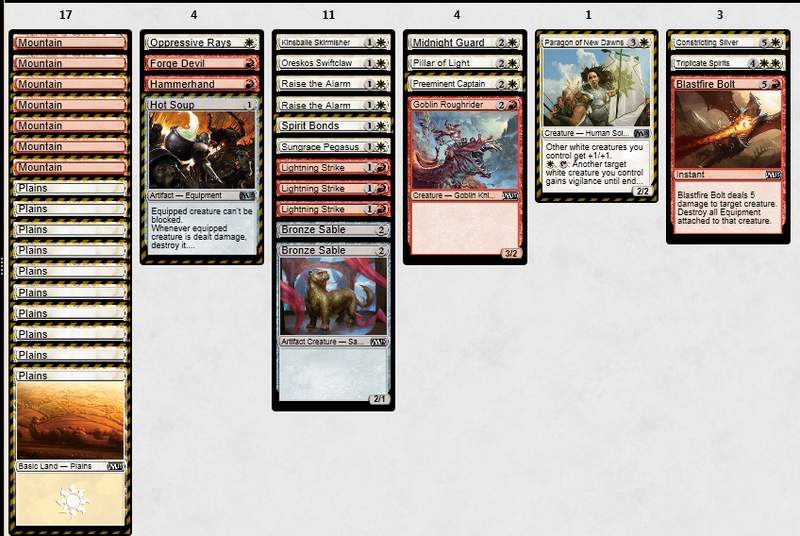 This Boros deck is actually really good, but I like BW even more. 3) Congregate is also going to gain insane lives. Pay all the life for First Response with the pain lands, then gain infinite life and go off again. Helps race decks with evasion so much. You also have 2x Bronze Sable to bring in vs Accursed Spirit and Krenko's Commando. Wow. I had no idea that they were doing this. Since I missed the prerelease I'm stuck with the objects, but looking forward to some phantom drafts once release ends. I have always loved drafting core sets, and free practice will be nice!